Enjoy Food & Travel co-writers Dagfinn Koch and Malin Kjelsrud visited Berlin August 22nd to August 25th 2008. Here they had a delicious meal in a Japanese restaurant. Here is what they ate. 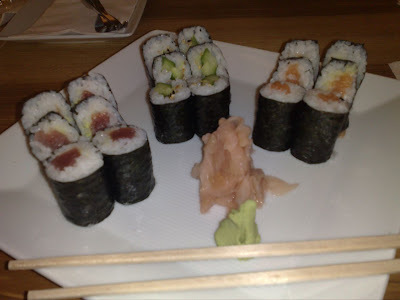 In the old west Berlin near by Wittenbergplatz you are recommended to visit the Japanese restaurant Akitama, with a chic minimalist interior and excellent service. We did, and were very pleased. Malin chose a Tori Munaniko No Grill as a main course, a chicken filét delicately arranged in a heart shape with salad, rice and a very good and spicy sauce. She was particularly curious of how the quail egg tasted, and it tasted like - surprise; an ordinary boiled egg, only smaller. Dagfinn went for the Aya-plate as main course and the Miso-Shiru as a starter. It both looked and tasted fantastic! And then Pudding time. We both chose the home made creme caramel for dessert, which Dagfinn described as even better than his own aunt makes. We sincerely apologize to Tante Bjørg for this confession on the net! This pretty much sums up the quality of the meal! We nearly forgot the wine. a japanese white wine (Oroya), but when arriving at the table it turned out to be a Spanish wine chosen by a Japanese, but the dry and fine aromas were perfect to the food. So if you go to Berlin, Akitama is highly recommended. The KaDeWe - Berlins Harrods is near by. 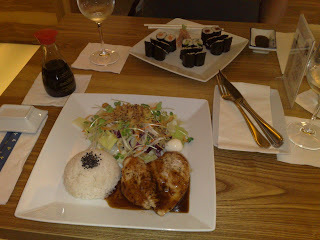 So after shopping - go to Akitama! Not futuristic - rather an error. This is no corrected - to past tense! !